Nigeria vice-president Yemi Osinbajo say im never think am whether im go contest for di 2019 presidential election. Na for di Financial Times meeting for London Osinbajo talk dis one, where im still talk say, ''E no dey for plan''. 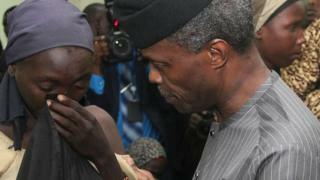 Osinbajo, wey be law professor, don popular after im step-in for President Muhammadu Buhari, wen im travel go abroad for treatment dis year. As e be say na only two years remain before another general election, people never know whether President Buhari go contest again. Buhari, wey don reach di age of 74, become president for 2015 but sickness no gree am do di work voters expect from am. Some top businessmen wey gather for di Financial Times meeting for London, say Osinbajo fit provide di kind stability Nigeria need if im enter di race for president for 2019. Dem point out say militants for di oil-rich Niger Delta region of Nigeria no dey cause wahala to oil production again. Osinbajo say last year Nigeria dey lose up to 1 million barrels per day of oil production because militants attack oil and gas equipment for Niger Delta region. Vice-president position no too get plenty power for Nigeria, but since democracy come back to di country for 1999, two other people wey hold di position don fight for di office of president. For 2003, former vice-president Atiku Abubakar leave di ruling Peoples Democratic Party to contest against im former boss, President Olusegun Obasanjo. For 2011, vice-president Goodluck Jonathan contest election after im don do acting president for two years when President Umaru Yar'adua die because of sickness.